Every evening I say "go get ready for bed" and the next thing I know my children turn into pajama clad lunatics whose sole purpose is to jump off every surface in the house while screaming. And then when I say, "have you brushed your teeth?" they look at me like I have 4 heads. And when I say, "why aren't you reading?" they say, "I didn't know we were supposed to". It's like you would never know that my children get ready for bed EVERY DAY. 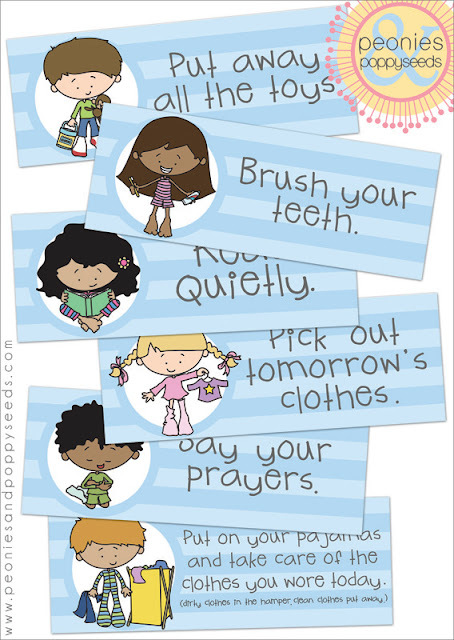 So I made these bedtime routine printables. And I'm going to glue them to a posterboard so that they're in order. And then I'm going to hang them somewhere glaringly obvious. So that next time I say "go get ready for bed" there's no questioning what I mean.